Photo’s of people born in the 19th century are more common in the U.S. than Ireland and other countries. The genealogy photo archive at www.deadfred.com has an image of James Loughlin, with the contributor of the photo outlining that he was born in 1818. The image can be clicked to enlarge. Kellymount, the townland which makes up one third of the village of Paulstown, is named after Joseph Keally/Kelly (1673-1713). Previous to this it was known as Ballimcloghlin, Baile Mhic Lachna in Irish. The earliest instance of a name for the area comes from the Calendar of Deeds of the 1220s with Balimaclacth given. Joseph Keally, was a descendant of Maurice O’Kelly, who had fled from county Offaly after the massacre of Irish chieftains at Mullaghmast about 1578. O’Kelly settled in the Gowran area and over the following decades the family name changed to Keally. 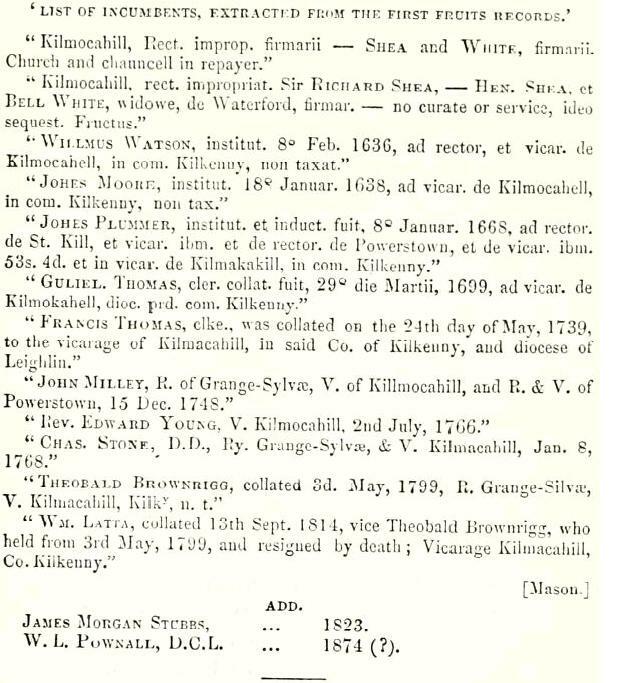 Joseph Keally was born in 1673 to John Keally and Elizabeth Cuffe, daughter of Captain Joseph Cuffe of Castle Inch, Kilkenny. Keally married Elizabeth Monke in 1707. Paulstown is located where the road from Dublin diverges into two roads, one going to Waterford (the N9) and one going to Kilkenny (now called the R712, was the N10 before the opening of the M9 motorway). The original core of the village was formed at a crossroads that goes to Goresbridge, about 150 meters from where the road from Dublin diverges for Waterford. It is probably fair to say that buildings and then a village came about as a resting place, nodal point or trading post in the road network from centuries past. Previous to having the name Paulstown (and it’s many various spellings), the area was known as Typerwoldric (again, various spellings are given). The name Typerwoldric probably comes from the Irish ‘Tobar Urlaic’ which translates as ‘the well of retching’ and was believed to be a cure for an upset stomach. Paulstown gets its name from Paul Butler who was given a grant of the manor of lands of the area in 1325. It has also been known as Whitehall for a period of time in the 19th and 20th centuries. At this point I have been unable to clearly identify when Whitehall began to be used and when, officially, it reverted back to the Paulstown name. Circa 1220 The earliest reference to the Paulstown area comes from a manuscript in the National Library of Ireland. It has the title “Grant by John de Claulla (Clahulle) to Richard Butelar of Typerwoldrich (now Paulstown, parish of Kilmacahil, Co. Kilkenny), (c. 1220?)”. 1235 The Calendar of Ormonde Deeds outlines how a grant of land was given to Adam Walensis in 1235. One of the witnesses to this land grant is Milo de Typerwoldric. 1305 A third reference to this name comes from the early 14th century in another National Library of Ireland manuscript, Quit-claim by Gilbert le Forester to John le Botiller of Typeroldryk (now Paulstown), c. 1305. 1325 Paul Butler received the manor and lands of Tyberwikick. 1571 The next earliest mention of Paulstown in The Fiants comes in entry 1926. It reads: “Pardon to Edmund Butler, of Pauliston, co. Kilkenny, gent. Fine £3. -28 December, xiv”. Entry 1927 reads: “Pardon to Peter or Piers Butler of Pauliston, co. Kilkenny, gent. Fine £3. -28 December, xiv”. There are a number of further entries up to 1603 with these spellings. 1842 In his 1884 publication Bassett outlines that the name of Paulstown was changed to Whitehall in the year 1842. 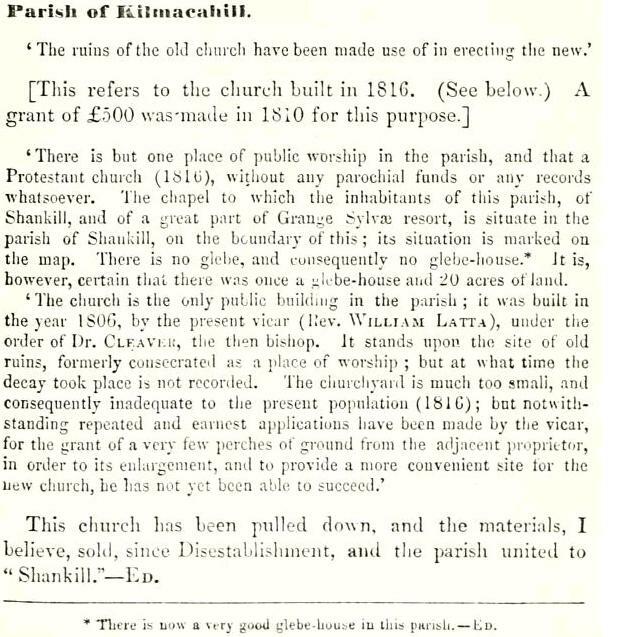 However, this was written over 45 years after Whitehall’s first mention in Lewis’ Topographical Dictionary of Ireland. Bassett, George Henry. 1884. Kilkenny City and County Guide and Directory. Dublin: Sealy, Byers and Co. 1884. p.317.